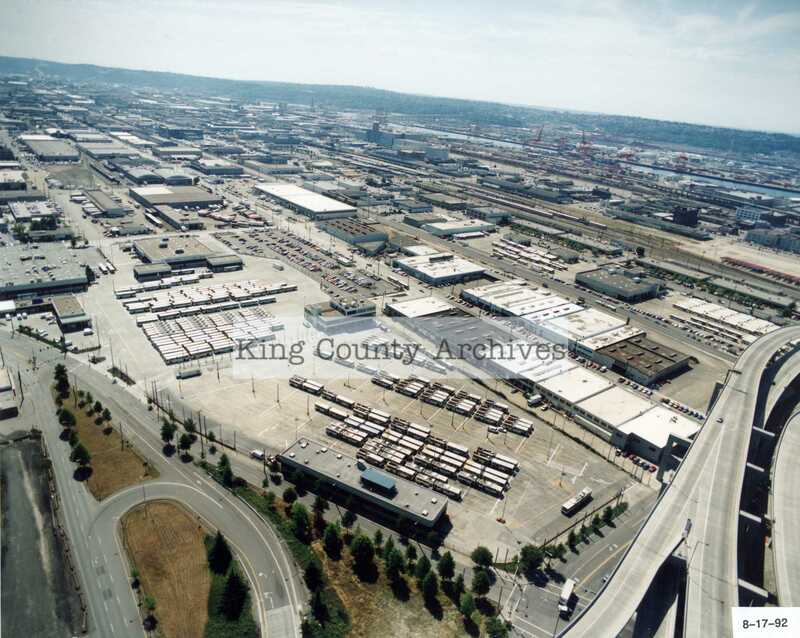 The Archives recently accessioned a small collection of records from the King County Department of Transportation’s Transit Division. These records include photographic prints, negatives and slides that were produced in planning for improvement or expansion of Metro bus bases. A basic principle in archives is that records can have value beyond the original purpose for which they were created. Although we can certainly learn about the physical layout, equipment, and condition of the Metro bases in the 1980s and 1990s from this collection, the photographs also give us other information. Many photographs in the series show building interiors and exteriors, and of course, buses. Here we will be talking about aerial photographs of the different Metro bases that were taken in 1991 and 1992. One way to use aerial photographs is to see how a place has changed over time. 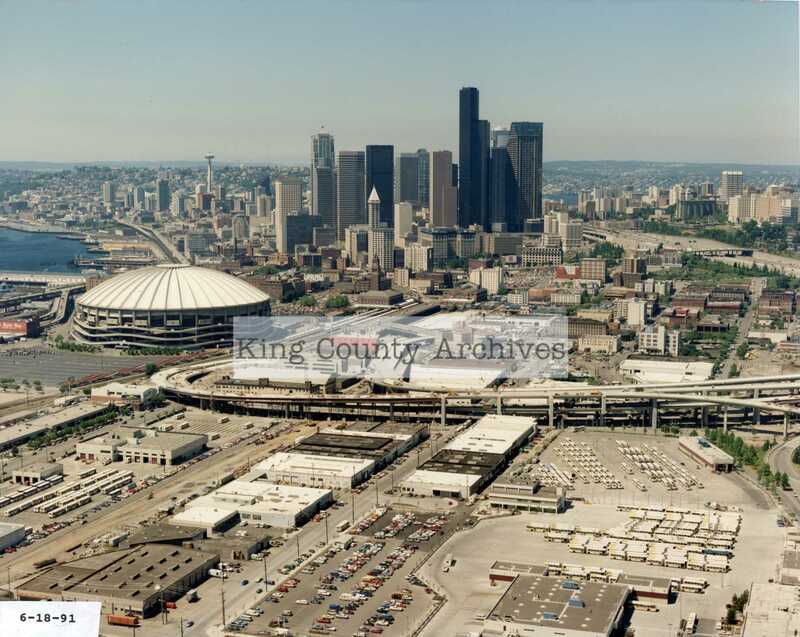 The Kingdome, seen in the above photograph, is a memory (to some), now replaced by CenturyLink Field. Below, photographs of Seattle’s “Hooverville,” taken during the Great Depression, show the same part of the city — from closer-in and at a lower angle — as it appeared in the 1930s. Landmarks like Smith Tower in the image on the right and the waterfront on the left help us compare the cityscapes. King County Archives Series 275, Department of Public Health, images 90.2.3167, 2/6/1933 (top or left) and 90.2.1794, 7/20/1932 (lower or right). The Metro base photos are taken at an oblique angle, which allows us to see topography, building height, and details of the urban landscape that we would not see in a straight vertical shot. Oblique photographs show space in linear perspective (more distant objects appear smaller), and lenses can introduce distortion, as below. Central Base (Seattle), 8/17/1992. Photographer Keith Purves. Vertical aerial photography minimizes distortion and was first introduced for use in mapping. 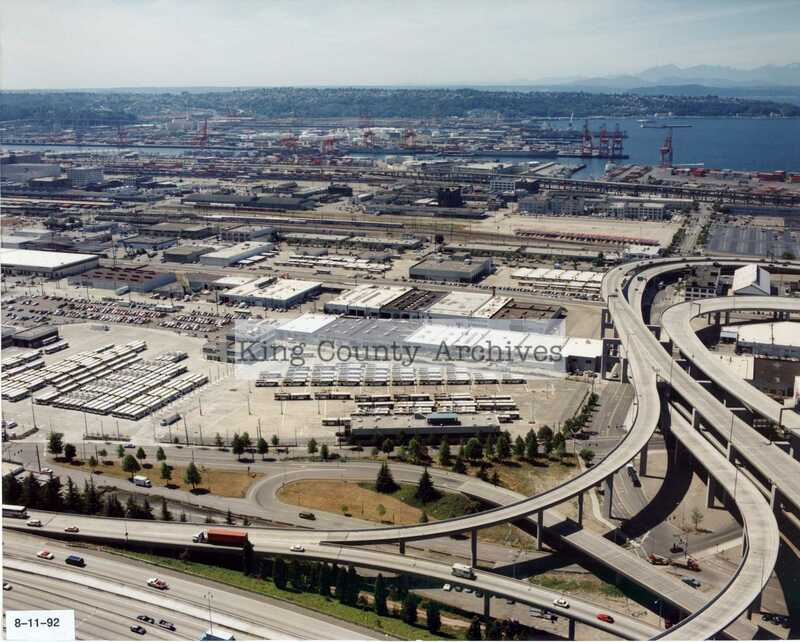 The King County Assessor’s WPA-funded 1936 Land Use Survey project combined data from traditional field surveying with systematic aerial photography to create a more accurate record of property throughout the County. In an archival collection of agency working files, notations can add meaning to a record. 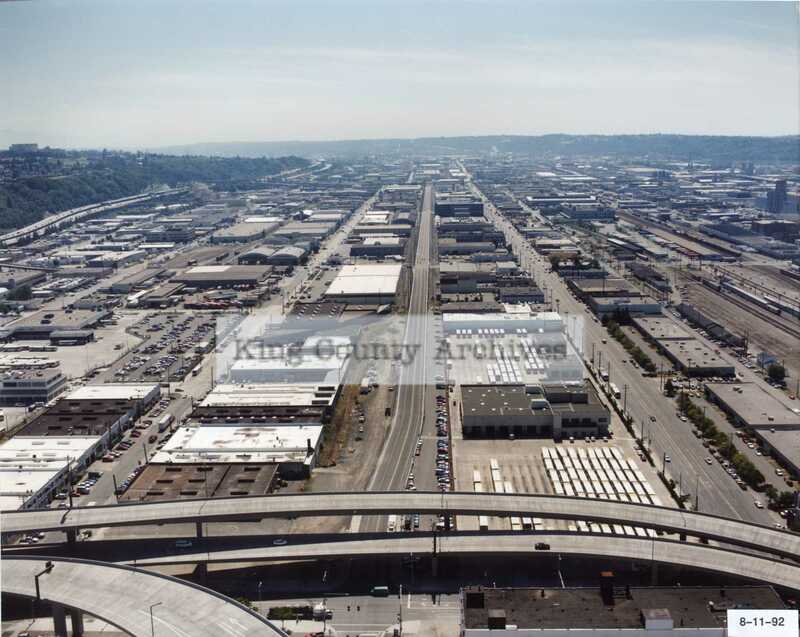 The below photograph of Ryerson Base (west of Central Base) came with a plastic overlay that indicates in striped tape a path that now, over 20 years later, is a segment of the SODO Multi-Use Trail, adjacent to Sound Transit’s light rail tracks. 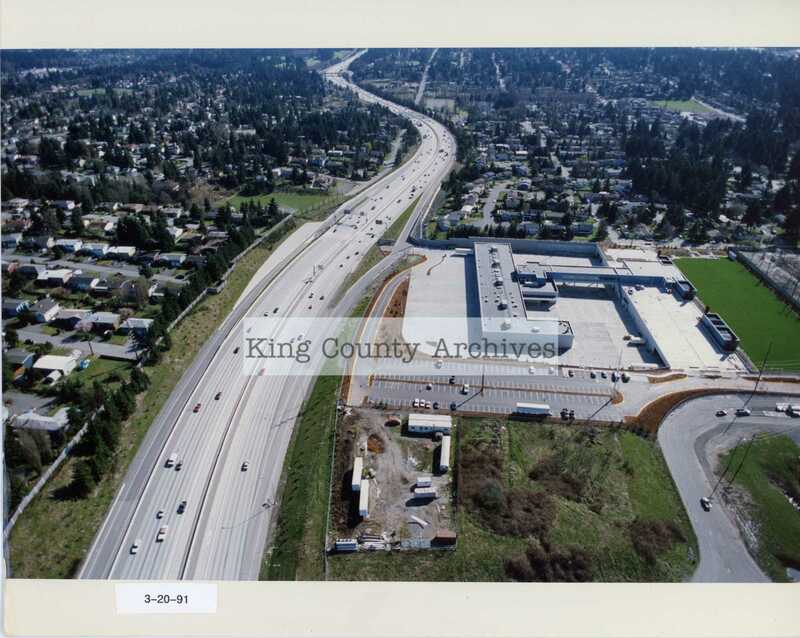 Related records in the collection may tell us the intent behind highlighting the right-of-way as part of facility planning in the 1990s. Without that context, we can guess but can’t know its original purpose. 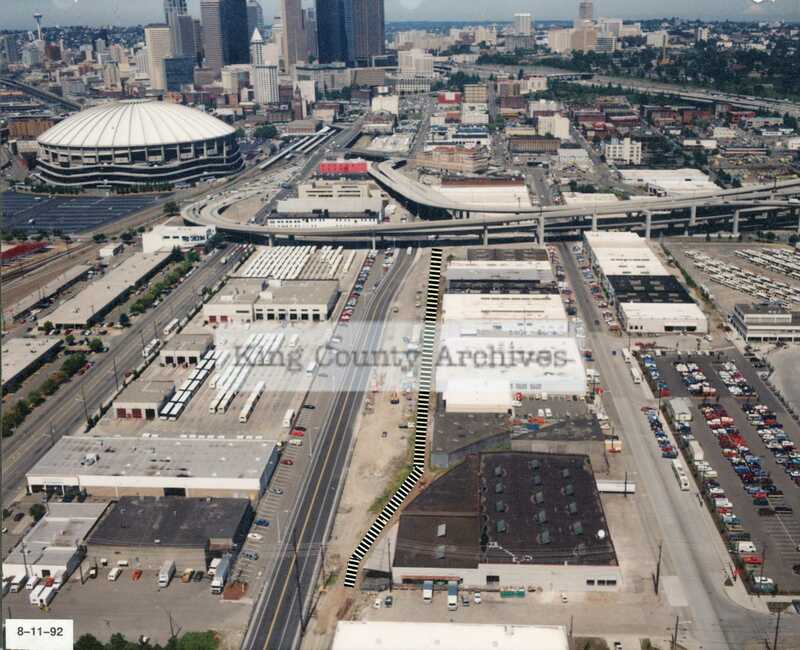 Ryerson Base (facing north, view of downtown Seattle), 8/11/1992. Photographer Keith Purves. Aerial photography has many applications in the natural sciences, such as geology and hydrology, as well as in social science and engineering fields, such as archaeology, transportation, and urban planning. 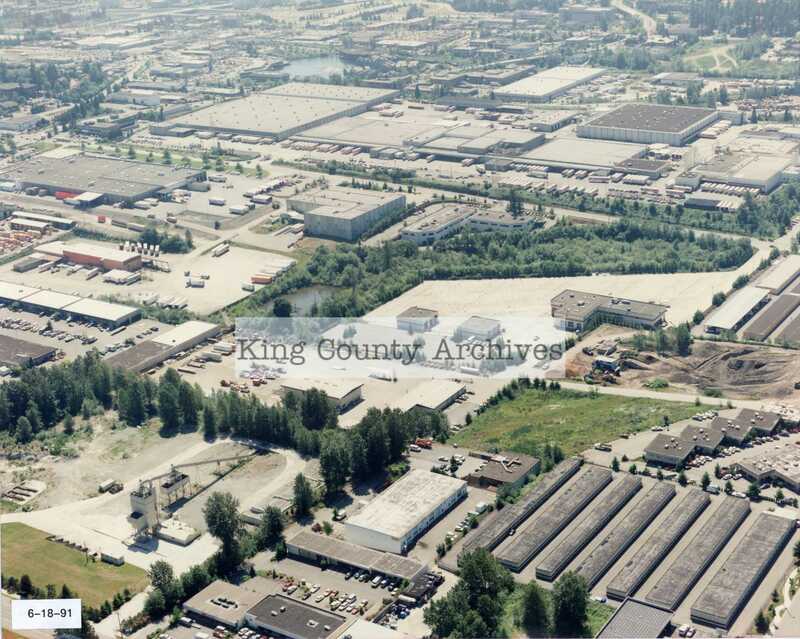 In the below image, we see a mix of light industrial uses alongside treed areas and bodies of water near the Bellevue Base. Though the landscape is not idyllic and can hardly be seen as “green,” we are reminded that the this type of space supports functional uses upon which we depend, including Metro’s environmentally friendly bus service. Bellevue Base, 6/18/1991. Photographer not identified. Seeing the land from bird’s eye view can help us reflect on the spaces we use and inhabit. Aerials can be beautiful as photographs and compositions, with their unexpected patterns and dramatic forms, combined with familiar landscapes and the details of daily life. Following are a few more images from the series. Central Base (Seattle), 8/11/1992. Photographer Keith Purves. North Base (Shoreline), 3/20/1991. Photographer not identified. Bellevue Base, 8/17/1992. Photographer Keith Purves. Ryerson Base (facing South), 8/11/1992. Photographer Keith Purves. 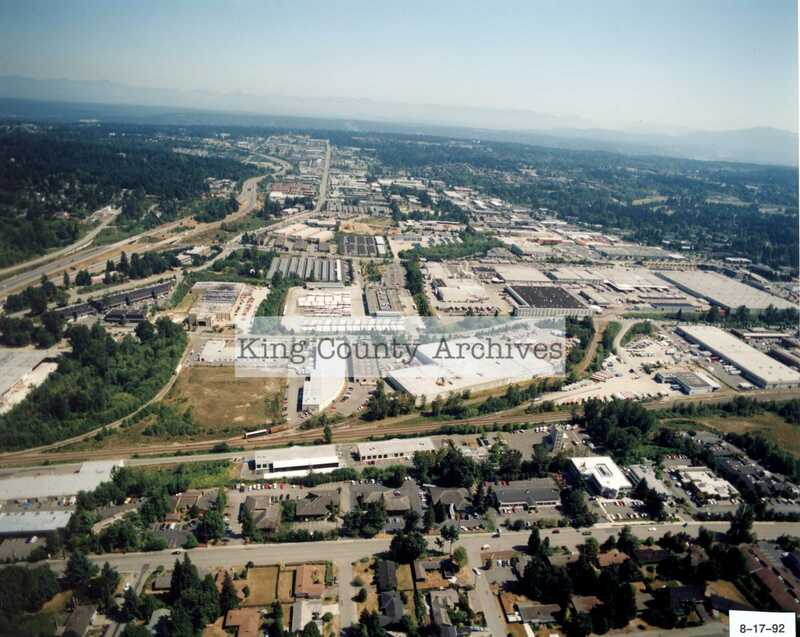 To learn more about aerial photographs in the King County Archives collection and elsewhere, please see our guide, Aerial Photographs.